Ever wonder how the Mexican restaurants make that wonderful rice that comes as a side dish with most meals? Here’s one way that gets you close. It’s actually pretty easy. About the only differences between this and making plain rice are the “toasting” of the rice and the addition of some flavorful ingredients. And if that “toasting” sounds familiar, it’s also what we do for risotto. Variations on a theme? But with a totally different look and feel. And taste. Saute onions in olive oil in a 2 quart pot about 3 minutes. 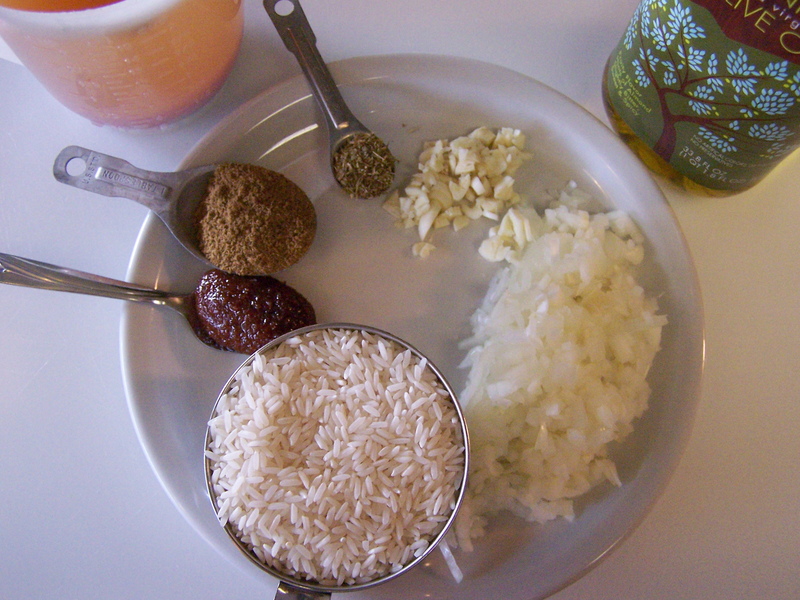 Add the rice and oregano to the oil and onions. Saute another 3 minutes while maintaining heat. Add the water and liquid from the diced tomatoes and chilies. Stir. Bring back to a simmer. Stir in the vegetable base. Adjust the heat to keep a simmer. Cover and simmer 20 minutes until rice is cooked and the fluid absorbed. Stir in the cumin and fluff with a fork. Remove from the heat. That’s it. At the end you’ll have a relatively fluffy (not gummy) reddish flavorful rice just like the restaurants serve. 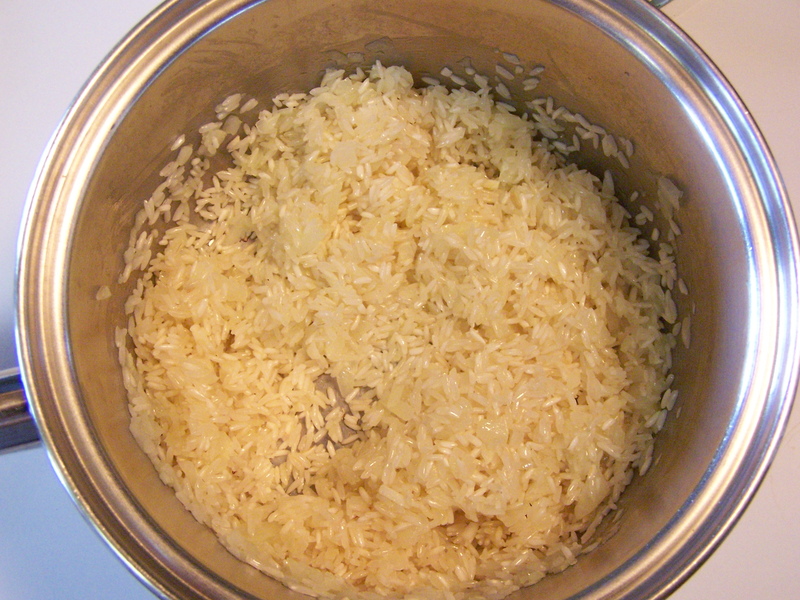 This recipe uses the classic proportions of one part rice to two parts liquid. 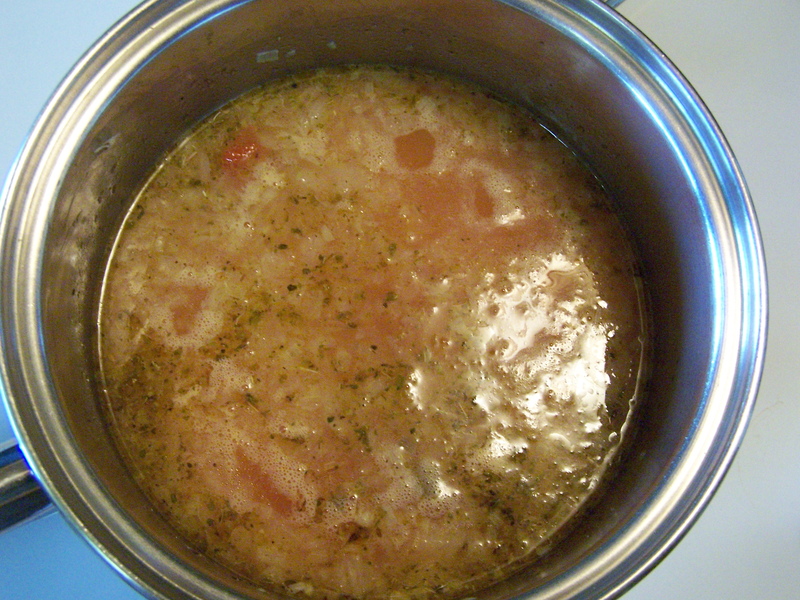 Drain the liquid from the can of diced tomatoes and green chilies into a two cup measuring cup (see picture). Add enough water to reach the 2 cup mark. In scientific terms this is known as QS or Quantity Sufficient (of water), to make a total volume of 2 cups. Surprisingly I can’t find a good web definition of QS. So no link here. To get more fluid from the can, use the lid to squeeze the fluid from the can. You’ll figure out what I mean. Add a few pieces of the diced tomatoes to the liquid. It will make the rice more colorful. Be sure to save the, now dry, diced tomatoes for salsa. Try this recipe. Of course you may substitute vegetable broth (or chicken broth for the non-vegetarians) instead of the Better Than Bouillon. But the Better Than Bouillon is pretty handy for adding some extra flavor and really is better than the usual bouillon cubes and powders. This is not a spicy Spanish rice. While the fluid from the tomatoes and chilies has a little bit of heat to it, once it’s all over, this is a very mild rice. Of course, that’s also how the restaurants usually prepare the rice. If you want to spice it up with some additional peppers (of your choice), feel free to do so. All combined and ready to cover and simmer. 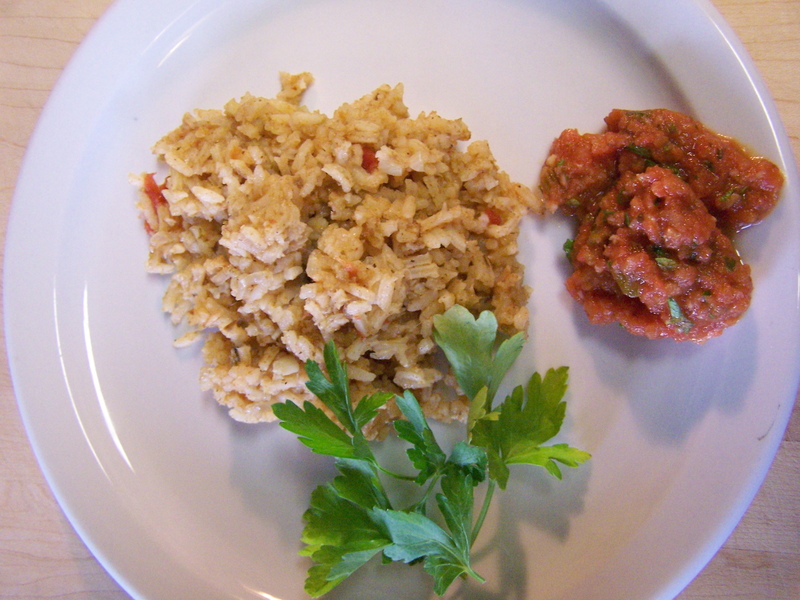 The finished rice with the bonus salsa. This entry was posted on 05/30/2011 at 20:41 and is filed under Recipes, Recipes, food, cooking and related items. You can follow any responses to this entry through the RSS 2.0 feed. You can leave a response, or trackback from your own site.